Firstly, our actual planes won't be able to do the things the Strikers planes can. 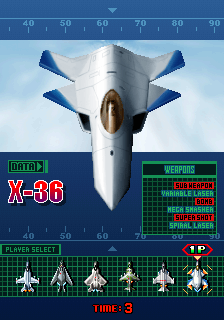 Even if the weapons are less exaggerated than they were in previous Strikers games (they'res missiles, bombs, and the like), they're still not gonna happen. 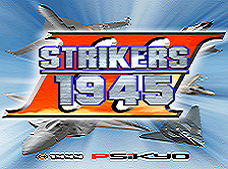 Strikers 1945 III is one of the more frantic, bullet-dodging games out there in the world of gaming. 1. The Supershot. As you destroy enemies, your Supershot Gauge increases. But unlike its predecessor, it grows in LEVEL, not QUANTITY of supershots. Which means your Supershot can gain power if you don't use it often. 2. Medals. Yes, they still vary from 200-2000 depending on if they're shiny or not, but Psikyo added a medal chaining feature. It's implemented whenever you get a medal at its shiniest (worth 2000pts). Collect another medal at its shiniest and it'll be worth 2200pts. Collect a third and it's 2400pts. The value of each medal after the first 2000pts one is 2000+(200*Number of Medals obtained after first one). But if you collect a medal when its NOT at its shiniest or if you die, the medal value drops back to normal. 3. Hit Center. Psikyo decreased the hit center area to somewhere near the center of your plane. A bullet has to hit THAT point to have your plane destroyed. So...it's not like Raiden, where if a bullet passes your ship, it dies. It's more of a Donpachi-ish kind now. 4. TECHINCAL BONUSES. Bosses have a power core shaped as an orb. By expertly dodging the bosses' attacks, you can make it reveal it. Go close to the orb, have it turn from blue to red, and shoot at the orb. The boss dies automatically and you get a boatload of points for your skill. Of course, the level system still applies. Basically, the higher level of power in your weapons you have, and the higher stage you are at, enemies will shoot faster and more plentifully. That's how the game tries to 'balance' the skill of the machine and you. You can still be powered down by colliding with an air enemy as well. The bosses can self-destruct if you take too long to destroy them (with a flashy WARNING countdown now, instead of spontaniously, like previous Strikers games). You still have the fancy 2nd loop, like always. And as always, it's harder. Music's not bad, graphics are good, makes Strikers 1945 III an excellent part of the Strikers series. You can select from 5 planes, each with different attack styles. If the machine supports it, you might even get a SECRET plane too! Here's links to short* summaries of the stages. The first four are random, the next ones are fixed. Millenmium Crisis Specialty: The Strikers series. Only thing is that it's in Japanese. They have pictures though, so it's still good.